Chris Hughton says days like Saturday's trip to Manchester United is what Albion worked so hard to gain promotion for. 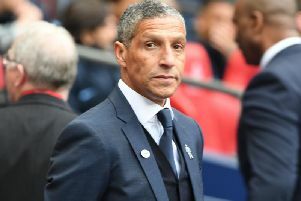 Hughton guided the Seagulls to promotion into the Premier League last season, after agonisingly missing out only on goal difference the previous year. Albion have made a solid start to life in the top flight and sit ninth in the table after 12 matches with 16 points. They travel to a United side who are second, eight points behind leaders Manchester City, but have a host of internationals throughout their squad and are unbeaten in 38 home matches. Paul Pogba and Zlatan Ibrahimovic have just returned from injury and Hughton knows Albion will have to play at a high level to have a chance of returning home with anything. He said: "We know what we'll have to do if we're to do that. There are not that many teams at our level that go there and win. "You've got to go there and play to a very high level. You've got to have that bit of luck that goes with a win away from home at any one of the big clubs but these are the days we've worked so hard for as a team and what we got promotion for. "We all know what Manchester United means, the stadium, the club, the history, so we all know what that means. "It's certainly a nicer place if you come away from there and have given a decent account of yourself. It's certainly not the best of places if you don't. "We hope we can give a good account of ourselves." We'll be running a live blog during Saturday's match. Keep an eye on the Albion section of our website for all the latest news, reports and reaction.